Established in 1938, A&L Foods, Inc. has been serving the major metropolitan areas on the East Coast with dry, frozen, and refrigerated retail and institutional specialty groceries. Servicing national and regional chain stores, large institutional accounts, independent grocers, specialty/ gourmet stores, delis, restaurants, nursing homes, hospitals and schools, A&L Foods is a unique, specialty food distributor. A&L Foods is the only distributor that can provide any type of customer with all of its kosher food needs; whether it is a chain store requiring a complete kosher foods program, or a deli seeking the finest smoked salmon. A&L Foods has the answer. 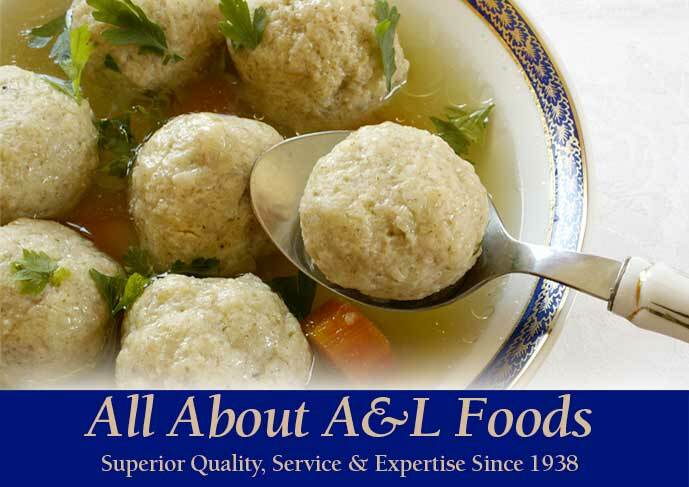 Although A&L specializes in kosher foods, we recently diversified our offerings to include natural, organic, vegan and other ethnic delicacies. After years of consolidation in the food industry, A&L Foods remains one of the last local, family owned and operated food distribution companies in the country. Now in our third generation, A&L Foods remains committed to our customers. A&L's dedication to service, and superior product knowledge has separated us from the competition.